Towers, you only had 2 choices about your end. 9/11 and what they went through. 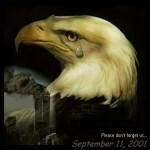 understand more about September 11, 2001.
shed, and many ordinary lives lost. That was a very thoughtful essay, Ivy. You explained the event and the emotion very well. I really liked this. It shows me a different perspective. Well done! Thought provoking, insightful, and well expressed. Great job!!!! I love this. It shows the sweet and compassionate girl that I know you are. I feel your heart in it. I enjoyed when we talked about it. The horror of it struck me the hardest when I saw the names and faces of each person on a chain we had made at school and hung in the hall. the chain was over 4 times the length of out building and you know how long the older elementary building is! Each link in the chain was only about 3-4 inches long. I thought about each of those links representing a REAL person that others loved and would miss. Mothers, fathers, grandmothers, grandfathers, aunts, uncles, children….it still brings tears to my eyes to think of it. These were persons that had been robbed of their lives and futures. Ended in a matter of minutes. hey it rocked the second time!!!!!!!! !